The Igbo, sometimes referred to as Ibo, are one of the largest single ethnic groups in Africa. Most Igbo speakers are based in southeastern Nigeria, constituting about 17 percent of the population; they can also be found in significant numbers in Cameroon and other African countries. It is believed the Igbo originated in an area about 100 miles north of their current location at the confluence of the Niger and Benue Rivers. 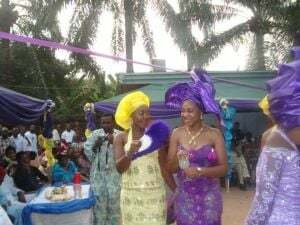 The Igbo share linguistic ties with their neighbors the Bini, Igala, Yoruba, and Idoma, with whom it is believed they were closely related until five to six thousand years ago. The first Igbo in the region may have moved onto the Awka-Orlu plateau between four and five thousand years ago. The Igbo came to worldwide attention in the 1960s when they attempted to secede from Nigeria and form the independent Republic of Biafra. Archaeological, linguistic, botanical and anthropological evidence suggest that the Igbo and their ancestors have lived in their present homes from the beginning of human history. According to Professor A. E. Afigbo, a scholar of Igbo heritage, "the Igbo, and perhaps the Idoma and most likely the Ijaw (Ijo), would appear to be the one of the only surviving coherent ethnic groups from the first set of proto-Kwa speakers to penetrate the forest areas of Southern Nigeria and who at one time occupied areas as far to the west as Ile-Ife in Yorubaland. Igboland is the home of the Igbo people and it covers most of Southeast Nigeria. This area is divided by the Niger River into two unequal sections – the eastern region (which is the largest) and the midwestern region. The river, however, has not acted as a barrier to cultural unity; rather it has provided an easy means of communication in an area where many settlements claim different origins. Today's Igbos are also surrounded on all sides by other tribes (the Bini, Warri, Ijaw, Ogoni, Igala, Tiv, Yako and Ibibio). Pre-colonial Igbo political organization was based on communities, devoid of kings or governing chiefs. The development of a heterarchical society, as opposed to a hetriarchical society, marks Igbo development as sharply divergent from political trends in pre-colonial West Africa. With the exception of Igbo towns such as Onitsha, which had kings called Obis, and places like Nri and Arochukwu, which had priest kings known as Ezes, most Igbo village governments were ruled solely by an assembly of the common people. Although titleholders were respected because of their accomplishments, they were never revered as kings. Their responsibility in society was to perform special functions given to them by the assemblies, not to make laws or dictate policy. This way of governing was immensely different from most other communities of Western Africa, and only shared by the Ewe of Ghana. The Igbo followed a calendar in which a week had four days. A month consisted of seven weeks, while thirteen months made a year. In the last month, an extra day was added. This calendar is still in use in villages and towns to determine the market days. The early Igbo utilized a mathematics system known as Okwe and Mkpisi, and used a saving and loans bank system called Isusu. Igbo secret societies also had a ceremonial script called Nsibidi. The Nigerian Civil War, also known as the Biafran War, of July 1967 through January 1970, was a political conflict caused by the attempted secession of the southeastern provinces of Nigeria as the self-proclaimed Republic of Biafra. The war became notorious for the starvation in some of the besieged war-bound regions, and the consequent claims of genocide made by the Igbo people of those regions. As a consequence of the war, Igboland had been severely devastated and many hospitals, schools, and homes had been completely destroyed. The Federal government denied the Igbo people access to all the hard currencies that had been saved in Nigerian banks before the war, only allowing a minuscule compensation of £20 per adult bank account holder in exchange for their savings, no matter the size. In addition to the loss of their savings, many Igbo found themselves discriminated against by other ethnic groups and the new non-Igbo federal government. Due to the discrimination of employers, many Igbo had trouble finding employment, and the Igbo became one of the poorest ethnic groups in Nigeria during the early 1970s. Igboland was gradually rebuilt over a period of twenty years and the economy was again prospering due to the rise of the petroleum industry in the adjacent Niger Delta, which led to new factories being built in southern Nigeria. Many Igbo eventually regained government positions. The Igbo, however, continue to face many problems and challenges, such as continued discrimination and forced emigration due to overpopulation. The Igbo are a profoundly religious people who believe in a benevolent creator, usually known as Chukwu, who created the visible universe (uwa), and is especially associated with rain, trees and other plants. According to the traditional religion of the Igbo, there is no concept of a gender type such as “man” or “woman” associated with the supreme deity Chukwu. The Igbo believe in the concept of Ofo and Ogu, which is a governing law of retributive justice. It is believed that Ofo and Ogu will vindicate anyone that is wrongly accused of a crime as long as "his hands are clean." It is only the one who is on the side of Ogu-na-Ofo that can call its name in prayer, otherwise such a person will face the wrath of Amadioha (the god of thunder and lightning). Tied to redistributive justice, Igbo believe that each person has their own personal god ("Chi"), which is credited for an individual's fortune or misfortune. Apart from the natural level of the universe, they also believe that another plane exists, which is filled with spiritual forces, called the alusi. The alusi are minor deities, and have the capacity to perform good or evil, depending on circumstances. They punish social offenses and those who unwittingly infringe upon the privileges of the gods. In order to commune with the spiritual level of the universe, diviners exist to interpret the wishes of the alusi. The alusi can also be reached through the priesthood, which placates them with sacrifices. Either a priest is chosen through hereditary lineage or is chosen by a particular god for his service, usually after passing through a number of mystical experiences. Ala – the earth-goddess, the spirit of fertility of man as well as the productivity of the land. Igwe – the sky-god. This god was not appealed to for rain however, as was the full-time profession of the rain-makers. Imo miri – the spirit of the river. The Igbo believe that a big river has a spiritual aspect; it is forbidden to fish in such deified rivers. Mbatuku– the spirit of wealth. Agwo – a spirit envious of other’s wealth, always in need of servitors. Aha njuku or Ifejioku – the yam spirit. Ikoro – the drum spirit. Ekwu – the hearth spirit, which is woman’s domestic spirit. There is a strong Igbo belief that the spirits of one's ancestors keep a constant watch over the living, and must be placated through prayer. Ancestors who had lived well, died in socially approved ways, and were given correct burial rites, were allowed to continue the afterlife in a world of the dead. The world of dead that was filled with honored ancestors mirrored the world of the living, and deceased relatives were periodically reincarnated among the living. The reincarnated dead were given the name ndichie, meaning "the returners." Those who died bad deaths and lack correct burial rites cannot return to the world of the living, or enter that of the dead. They wander homeless, expressing their grief by causing destruction among their living counterparts. The funeral ceremonies and burials of the Igbo people are extremely complex, the most elaborate of all being the funeral of a chief. However, elaborate funeral ceremonies were not granted to those who died from the several kinds of deaths that are considered shameful, and in these circumstances no burial is provided at all. Women who died during childbirth, children who die before they have teeth, those who commit suicide and those who die in the sacred month – for these people their funeral ceremony consists of being thrown into a bush. Also seen as shameful, multiple births were considered part of the animal world and twins were put to death, as were animals produced at single births. Children who were born with teeth, or whose upper teeth came first, babies born feet first, boys with only one testicle, and lepers, were all killed and their bodies discarded in secrecy. Religious taboos, especially those surrounding priests and titled men, involved a great deal of asceticism. The Igbo expected in their prayers and sacrifices, blessings such as long, healthy, and prosperous lives, and especially children, who were considered the greatest blessing of all. The desire to offer the most precious sacrifice of all led to human sacrifice; slaves were often sacrificed at funerals in order to provide a retinue for the dead man in life to come. There was no shrine to Chukwu, nor were sacrifices made directly to him, but he was understood to be the ultimate receiver of all sacrifices made to the minor deities. Some Igbo still practice traditional Igbo religion. Although the Igbo have been largely Christianized due to a large missionary presence in Nigeria, indigenous belief systems retain some influence, particularly in the suburban and rural villages. As with most Christianized peoples, Christian Igbos incorporated many of the culture's indigenous values, customs and traditions into their own systems of Christian worship, merely deemphasizing their origins. Most of the Christian Igbos are Roman Catholics. Members of Jewish Igbo believe that they are descendants of Jews who had migrated to western Africa over many centuries via migrations south into sub-Saharan Africa, as well as west across North Africa, possibly following the path of the Arab conquests. Some Nigerian Jews hold that families amongst the community are descendants of Kohanim and Levites, the Jewish priests and their assistants who functioned in the Temple of Jerusalem, who settled in West Africa during the days of the Songhai, Mali, and Ghana empires. Benei Gath: The Tribe of Gath ben-Ya`aqov (Gad), who was the eighth son of the Israelite patriarch Ya`aqov (Jacob). This group traces its lineage through Gath's son Eri ben-Gath. The groups from this lineage comprise the Aguleri, Umuleri, Oreri, Enugwu Ikwu, Ogbunike, Awkuzu, Nteje, and Igbariam clans. Benei Zevulun: The tribe of Zevulun ben-Ya`aqov (Zebulun), who was the fifth son of Ya`aqov (Jacob). These groups comprise the Ubulu Okiti and Ubulu Ukwu clans in Delta State who settled in Ubulu Ihejiofor. According to oral tradition, it is said that a descendant of the Tribe of Zevulun named Zevulunu, on the advice of a certain Levite, married a woman from Oji, who was descended from the Tribe of Judah, and from this union was born Ozubulu ben-Zebulunu. Ozubulu then went on to have four sons of his own who settled in other regions. These sons were: Amakwa, from whom a clan in Neni, Anambra State is descended, and Egbema, from whom the Egbema Ugwuta clan in Imo State and the Ohaji Egbema clan in Rivers State are descended. Benei Menashe: The Tribe of Menasheh ben-Yoseph (Manasseh). Menasheh who was one of the grandsons of Ya`aqov (Jacob) through his 11th son Yoseph (Joseph). According to the Torah, Jacob claimed both Menasheh and his brother Ephrayim as his own sons. It is theorized that the Igbos of the Amichi, Ichi and Nnewi-Ichi clans are descended from this lineage. Israel has, to date, not recognized the Igbo as one of the Lost Tribes of Israel. It took many years before the Chief Rabbinate recognized the Bnei Menashe as Jews, and it is thought that in due time the Igbo will also be recognized as descendants of Israel. One of the theories as to why Israel is reluctant to recognize the Igbo is because it has enjoyed good relations with Nigeria, and as the Igbo are a secessionist tribe, recognizing them as part of Israel may injure political and economic ties between the two countries. In 1967, Israel covertly transferred arms captured during the 1967 Six-Day War to Biafra, to help the Igbos liberate themselves and officially declare independence from Nigeria. This Igbo effort culminated in the Biafra War, led by Chukwuemeka Odumegwu Ojukwu. Traditionally, the Igbo have been subsistence farmers, their main staples being yam, its harvesting is a time for great celebration. Other staples are cassava, and taro. Corn (maize), melons, pumpkins, okra, and beans are also grown. Kinship groups own the land communally and make it available to individuals. The principal exports are palm oil and palm kernels, harvested from the fruit of the palm tree. Exported to Europe in large quantities, it is a profitable cash crop. Trading, local crafts, and physical labor are also important to the economy. A high literacy rate has helped many to become civil servants and business entrepreneurs. Igbo women engage in trade and are influential in local politics. The Igbo have a rhythm of music which consists of drums , flute, Ogene, Igba, Ichaka and other instruments. When accompanied by vocals this style of music is called Ikorodo. Another popular musical form among the Igbo tribe is "Highlife," which is a fusion of jazz and traditional music and is widely popular in all of West Africa. The Igbo people largely speak the Igbo language, a tonal language, such as Yoruba and Chinese. The language was used by John Goldsmith as an example to justify deviating from the classical linear model of phonology as laid out in The Sound Pattern of English. It is written in the Roman script. Following the Nigerian Civil War of the late 1960s, many Igbo emigrated out of the traditional Igbo homeland in southeastern Nigeria due to a growing population. Not only have the Igbo people moved to Nigerian cities including Port Harcourt, Lagos, Benin City, and Abuja, but have also moved to other countries such as Cameroon, Equatorial Guinea, Gabon, Ghana, Togo, Canada, the United Kingdom and the United States. Prominent Igbo communities outside Africa include those of London England, Houston Texas, California, Atlanta Georgia and Washington, DC. ↑ Sources vary widely about the population. Mushanga, 166, says "over 20 million"; Nzewi (quoted in Agawu), 31, says "about 15 million"; Okafor, 86, says "about twenty-five million"; Okpala, 21, says "around 30 million"; and Smith, 508, says "approximately 20 million". ↑ A.E. Afigbo, "Prolegomena to the study of the culture history of the Igbo-Speaking Peoples of Nigeria," Igbo Language and Culture. (Oxford University Press, 1975), 28. ↑ Stephen M. Saideman, Explaining the International Relations of Secessionist Conflicts: Vulnerability versus Ethnic Ties, International Organization 51(4) (Autumn, 1997): 721-753, abstract available at: jstor.org. Retrieved June 20, 2007. Afigbo, A.E. Igbo Language and Culture. Oxford University Press, 1975. Forde, Cyril Daryll, and G. I. Jones. The Ibo and Ibibio-speaking peoples of south-eastern Nigeria. Ethnographic survey of Africa, Part 3. London, New York: Published for the International African Institute by Oxford University Press, 1950. Mushanga, Tibamanya Mwene. Two aspects of violence in Africa: the social and political: revised text of a lecture delivered at Carleton University on September 19, 1994. Ottawa: Dept. of Sociology and Anthropology, Carleton University, 1994. Uchendu, Victor Chikezie. The Igbo of southeast Nigeria. Case studies in cultural anthropology. New York: Holt, Rinehart and Winston, 1965. All links retrieved February 24, 2018. Art and Life in Africa Project. Igbo Information. University of Iowa. Widjaja, Michael. Guide to Igboland’s Culture and Language. Igboguide. This page was last modified on 24 February 2018, at 22:38.